Fireworks in Ellerbe, Hamlet set to launch at about 9:30 p.m.
ELLERBE — Dalton Jenkins is about two weeks away from traveling to the Marine Corps Recruit Depot at Parris Island to begin boot camp. The goal is there to complete 12 weeks of “trial and triumph … Those who prevail after 12 demanding weeks will emerge completely transformed, prepared to defend our country and each other.” He wants to be a Marine. 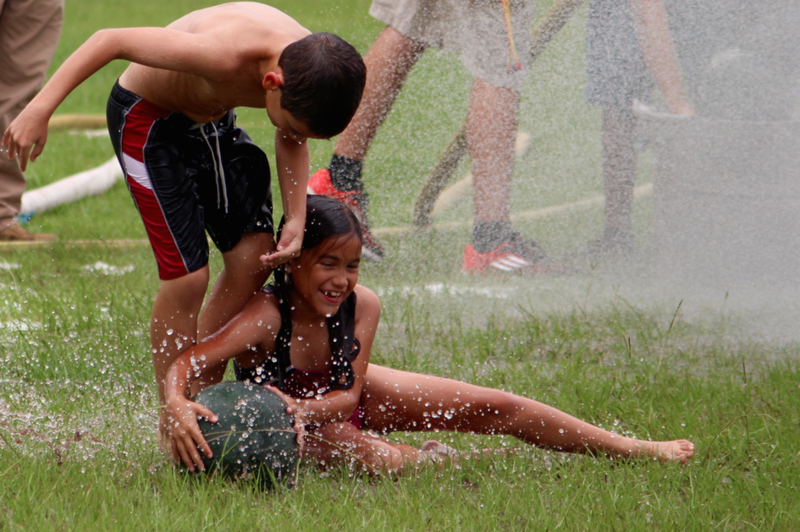 Elijah Tang, 10, and little sister Anna, 8, both of Troutman, wrestle for a watermelon. On Saturday at Ellerbe Lions Club Park, though, Jenkins found himself in a different kind of struggle. His obstacles were a slippery grass course, a firehose streaming high-powered water and three fellow volunteer firefighters Charles Barrett, Mike Mabe, Matt Kaschak and Corey McLaughlin. The task: Cover a 50-meter course, breach the obstacles and grab hold of a soaped-up watermelon from a rubber container. And through strength, good footing and yes, sheer luck, Jenkins came away with the prize. It was a great way to cap the first of several contests throughout the afternoon hours at Ellerbe Lions Club Park, kicking off the annual 4th of July Jamboree. Outgoing Lions Club President Joey Bostick introduced newly installed President Ken Lyerly, who took over July 1 for a two-year term. 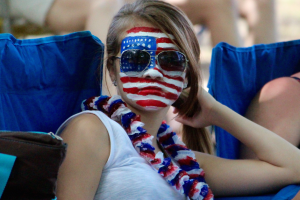 Lyerly noted the club exists to provide a service to the community — eyeglasses for those in need, a daytime home for the Ellerbe Senior Center and, of course, one heckuva 4th of July Jamboree and fireworks display. Alicia Faye Whaley, 14, of East Rockingham, and cousin P.J. 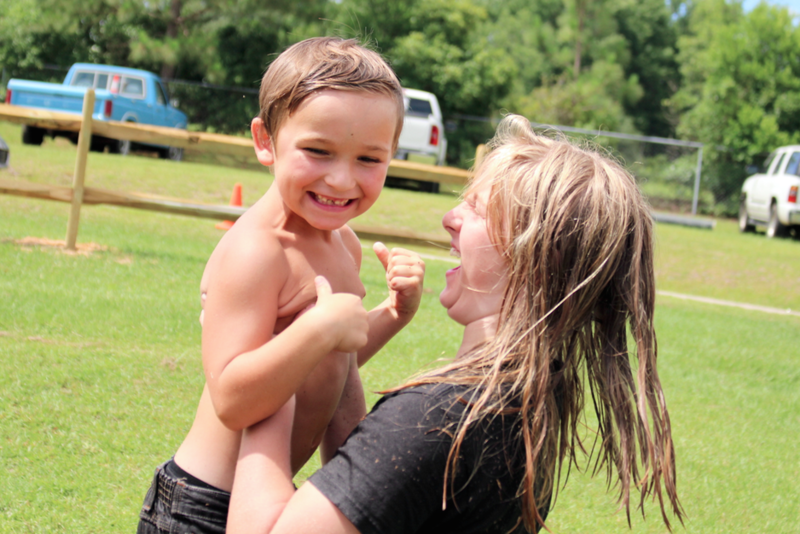 Scott, 6, celebrate winning the three-legged race. He then announced Sen. Tom McInnis, an Ellerbe native, as the Lions Club Citizen of the Year. McInnis won 50.4 percent of the vote in the November 2014 election to oust one-term incumbent and former Rockingham mayor Gene McLaurin, a Democrat. McInnis garnered 28,496 votes to McLaurin’s 26,632 (47.1 percent). Libertarian P.H. Dawkins, of Hamlet, tallied 2.5 percent (1,412 votes). McInnis said the award was a surprise to him and that he was “humbled” to receive it. He took a moment to remember the late James “Jim” Clifton, who died June 24 at the age of 76. Clifton was a longtime Lion but also McInnis’ high school teacher and coach. 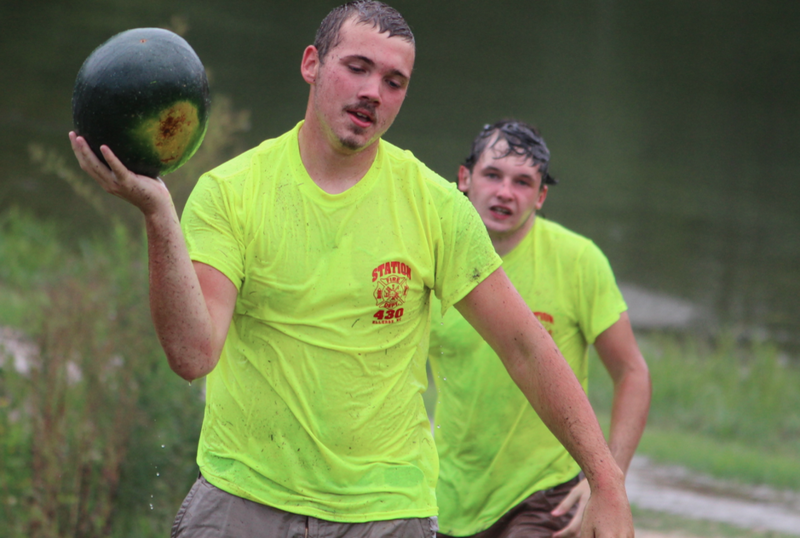 Dalton Jenkins walks away with a watermelon after battling fellow volunteer firefighters, a couple of hoses and a very slippery course. The focus of activity, though, was on the slanted fields of Lions Club Park and inside the building. 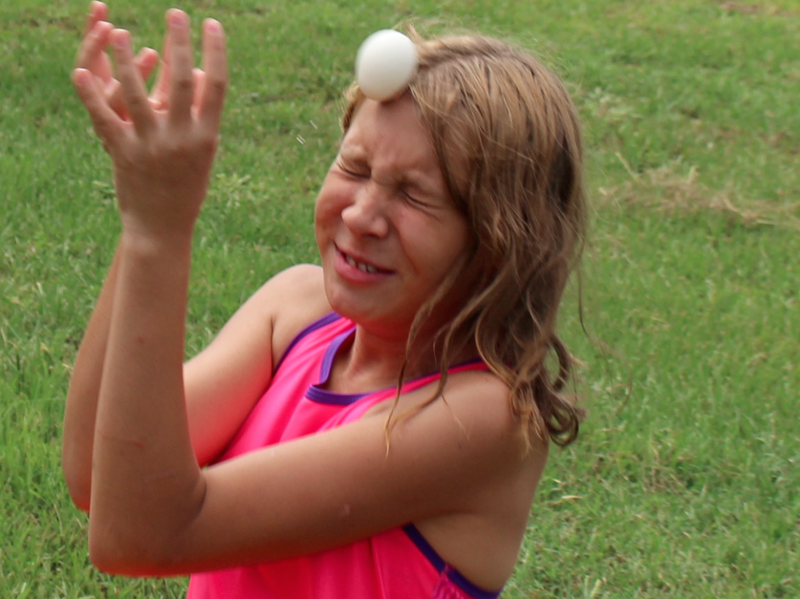 The former included egg tosses, egg races and three-legged races and, inside, face painting and nail painting — along with refreshing air-conditioner, barbecue and snacks. 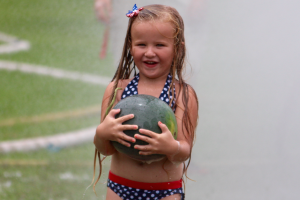 While attendance in the early hours — the gates opened at 10 a.m. for people to grab their favorite spot, but there was plenty of room inside the park at 4:30 p.m. — McInnis predicted up to 5,000 people would witness the fireworks display. Lyerly said this year’s display will be about 50 percent bigger than last year’s and be approximately 30 minutes in duration and cars normally fill the inside of the park and roadways all the way to Ellerbe. 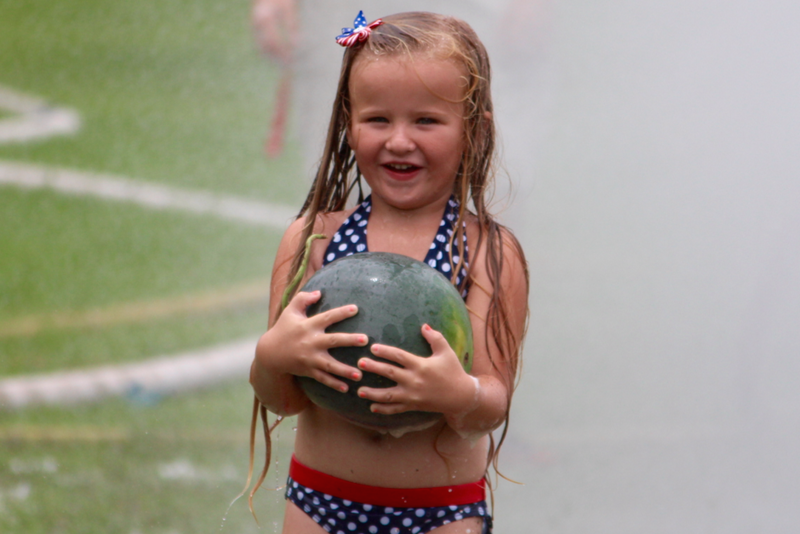 Lanta Braswell, 5, of Troy, proudly carries her watermelon to her grandma, Annette Stewart, of Ellerbe. Daisy Oxendine, 14, of Laurinburg, presents her All-American look. Kelli Bass, 11, of Ellerbe, misses the throw from her brother Cameron, 7 — but the duo won the event by being the last group to drop their egg.